We're still a few days away, but here's a preview of the 2016 Halloween weather. Note that there will be no repeat of the 1991 Halloween Blizzard across the Upper Midwest, but a storm system is expected to be pushing through the Upper Midwest on Monday, October 31st. At this point, blustery winds and scattered light rain showers may be possible as we head through the day. Here's the national weather outlook for Monday, October 31st, which shows scattered rain showers across the northern tier of the nation and parts of the West Coast. There also may be a few snow showers in the high elevations out west. The only place that may see thunder is near the Coastal Bend of Texas. High temperatures will be quite a bit warmer than average across much of the nation with highs nearly 10F to 20F above average! Here's a look at Hurricane Seymour in the Eastern Pacific from early PM Wednesday, which showed the storm going from a category 4 hurricane with winds sustained at 150mph to a category 3 storm with winds sustained at 125mph. As of PM Thursday, Seymour was a Tropical Storm and will likely continue to fizzle through the end of the week. Yep. That's snow on the National Weather Service webcam from Binghamton, NY on Thursday afternoon. Much of the snow will taper by the end of the week and will likely melt into the upcoming weekend. 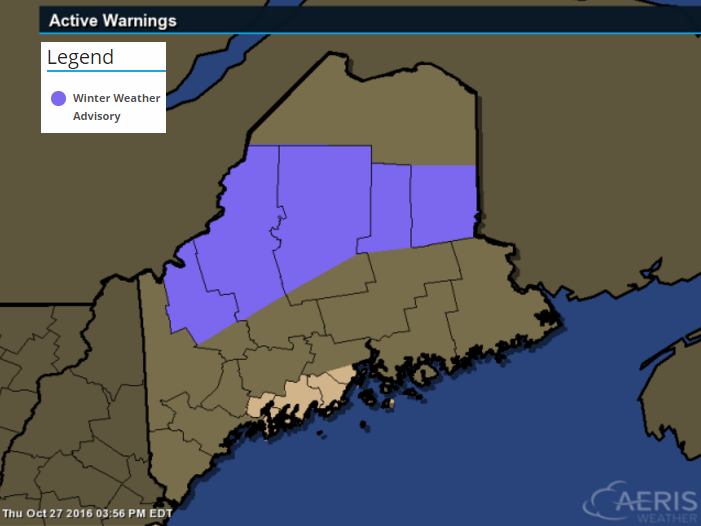 * LOCATIONS...NORTHWEST AND CENTRAL MAINE HIGHLANDS. * SNOW ACCUMULATIONS...3 TO 6 INCHES...WITH LOCALLY 6 TO 9 INCHES POSSIBLE FOR TERRAIN ABOVE 2500 FT.
* IMPACTS...MODERATE. SNOW WILL RESULT IN DIFFICULT DRIVING CONDITIONS. HEAVY WET SNOW MAY CAUSE TREE BRANCHES TO SNAP WITH ISOLATED TO SCATTERED POWER OUTAGES POSSIBLE. * WINDS...EAST 10 TO 15 MPH WITH GUSTS UP TO 25 MPH. 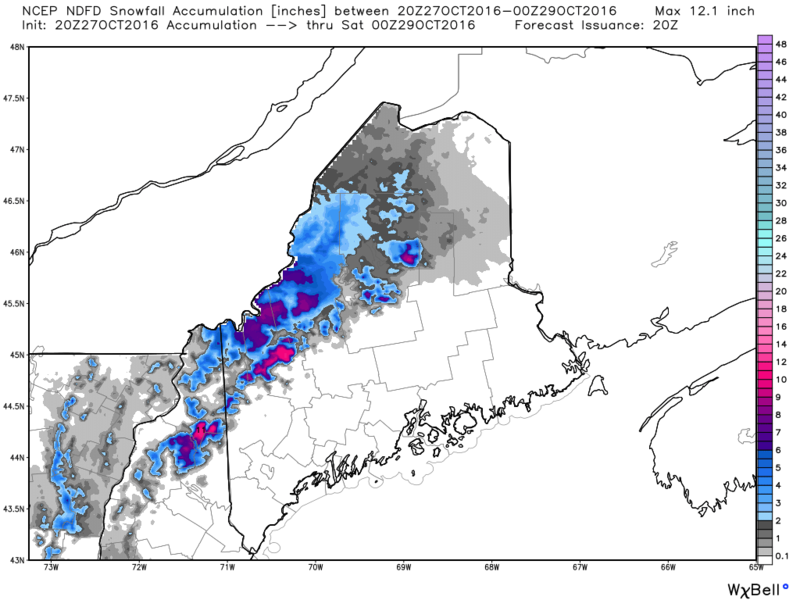 Here's the additional snowfall potential through PM Friday, which suggests some heavier tallies across the high elevations of central and northern Maine. Here's the simulated radar from PM Thursday to AM Saturday in the Northeast, which shows the storm system swirling through the Northern New England States with additional snowfall and scattered rain showers. Note that as that system moves out, another quick moving system moves in, but lighter amounts of precipitation are expected with this one. Break out the shorts and t-shirts today! 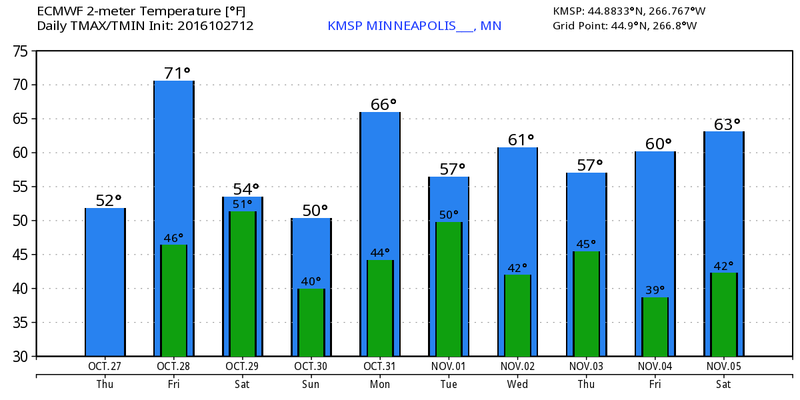 Well, that may be a little extreme, but don't be surprised if you see a few brave Minnesotans sporting a lighter wardrobe as high temps flirt with the 70 degree mark by the afternoon. Isn't it amazing how warm 60s and 70s feel after spending a couple of days in the 40s and lower 50s? Hey, I'm not complaining. My tomato garden is still producing and I'm not quite ready to break out the snow blower! 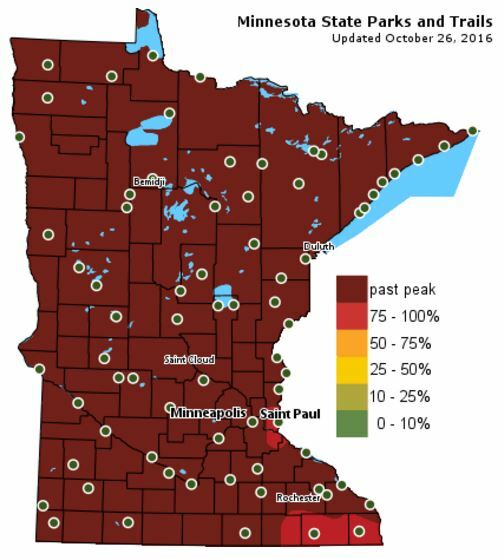 Interestingly, we haven't seen an official frost in the Twin Cities yet! Note that the average first 32 degree low temp is October 8th. A storm system racing across southern Canada will help boost high temps to near 15 degree above average levels Friday. 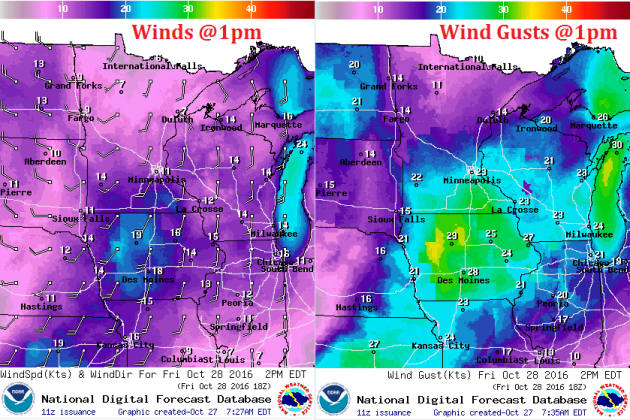 A cooler wind develops Saturday as temps settle back to near normal levels for late October. The wind picks up out of the south again on Halloween Monday allowing temps to surge back into the 60s. No extra layers for the ghouls and goblins this year. It will be a bit breezy with a few light rain showers, but we'll be blizzard free. THURSDAY NIGHT: Mostly cloudy. Winds: SSE 5. Low: 45. FRIDAY: Partly sunny, mild and breezy. Winds: SSW 10-15. High: 69. FRIDAY NIGHT: Partly cloudy. Winds: WNW 5-10. Low: 46. SATURDAY: Cooler breeze. Light PM rain. Winds: NNE 5-15. High: 55. SUNDAY: Chilly start. More afternoon sun. Winds: SE 5-15. Wake-up: 40. High: 56. 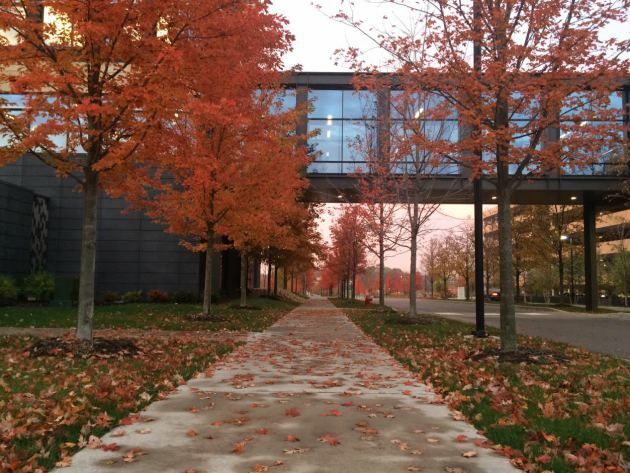 Halloween Monday: Blustery Halloween. Few showers. Winds: SSW 10-20. Wake-up: 46. High: 62. TUESDAY: Clearing with a cooler wind. Winds: W 10-15. Wake-up: 47. High: 55. WEDNESDAY: Turning nippy. Showers south. Winds: N 10-15. Wake-up: 40. High: 52. THURSDAY: Chilly sunshine. Winds: NE 5-10. Wake-up: 36. High: 48. 1960: A 29-day dry stretch in west central Minnesota ends. High temperatures on Thursday will be warmer than what we saw on Wednesday, except for locations closer to the Great Lakes. However, note that some 60s will be starting to move into the southwestern part of the state! This is the milder weather that will be moving in by Friday. High temps from average on Thursday will start warming to above average levels once again across the western part of the state. This warmer weather will continue streaming into the region through Friday, where much of Friday looks to be 10F to 15F above average! As our midweek soggy storm system pushes east, a southerly wind will start to develop on Thursday, which will help to warm temperatures through the end of the week. Our wet weather from earlier this week will have subsided, but clouds look to linger into Thursday with much of the state seeing mostly cloudy skies. 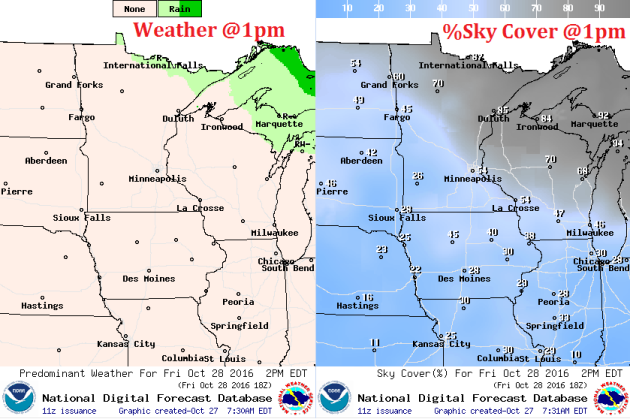 However, note that parts of western Minnesota will start breaking out into more sun later in the day. Here's the simulated radar from AM Thursday to PM Saturday, which shows mostly dry conditions across the region until later Saturday when a narrow band of light showers looks to move through the region. 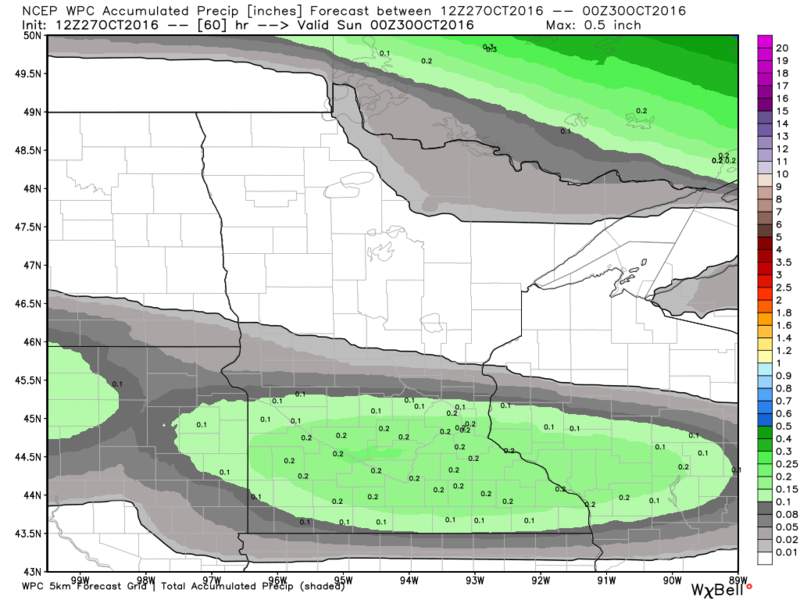 As our next system moves in from the west on Saturday, light precipitation will be possible across the central and southern part of the state with a few spots seeing up to a couple of tenths of an inch of rain. 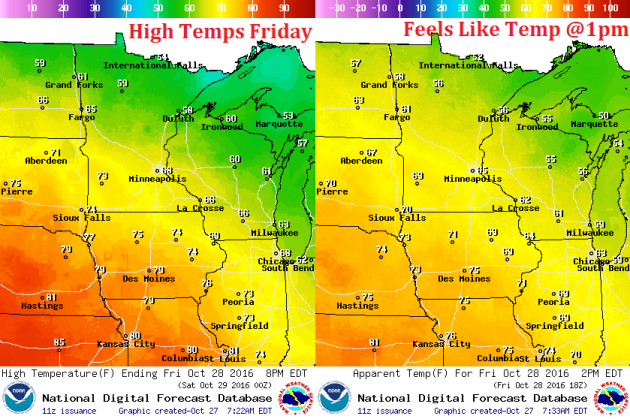 Thanks to a storm system sliding across southern Canada, warm temperatures will be allowed to settle in across the Upper Midwest on Friday. Note that this warm bubble of air looks to be fairly short lived and only with us for one day as cooler air moves in already by Saturday. The extended temperature outlook over the next 10 days shows temperatures warming rather quickly on Friday with highs approaching 70F! This will be a rather brief warm up though as high temperatures slide back down to near average levels this weekend. However, mild temps look to continue on Halloween Monday and through much of next week. According to NOAA's CPC, the 6 to 10 day temperature outlook suggests warmer than average temperatures continuing across much of the Upper Midwest as we head into the early part of November. Here's the national temperature outlook from November 2nd - 6th, which shows warmer than average conditions across much of the nation. Snowfall and cold rain showers will taper in the Northeast on Friday. Meanwhile, weather conditions in the Western U.S. will remain fairly active with wave after wave of heavy Pacific moisture. Some of this moisture will make its way into the Upper Midwest over the weekend, but it will be much lighter than it is out west. According to NOAA's WPC, the heaviest precipitation across the nation will be found in the Western U.S., where come 3" to 6"+ amounts can't be ruled out across parts of California. Much of the Central U.S. will remain dry with the exception of the far north and those in the Northern New England States. Here's a look at the national snowfall potential through early next week, which shows decent snow accumulations possible across parts of the Intermountain West. Note that there may even be snow snow accumulations across the Sierra Nevada Range in California! "Australia Climate Report Predicts More Hot Days and Harsher Fire Seasons"
"SYDNEY, Australia — Australia will have more extremely hot days and a longer and fiercer fire season, and parts of the continent will spend more time in drought as rainfall decreases, according to a report by top government scientists released on Thursday." "Surface temperature has increased about 1 degree Celsius since 1910, the report said, and rainfall through the growing season for winter crops has dropped almost 20 percent in some regions. Sea levels are also rising as ocean temperatures warm, leading to higher chances of inundation and coastal flooding. Oceans absorb large amounts of the world’s excess heat." 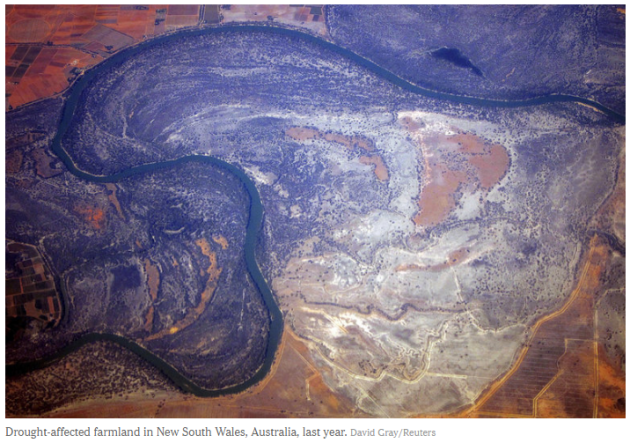 "Extreme weather events are increasingly common, said Steve Rintoul, interim director of Australia’s climate science center at the Commonwealth Scientific and Industrial Research Organization and an author of the report. And that trend will continue." "“Although a 1-degree-Celsius rise in air temperatures seems small, it is enough to shift base-line averages,” Dr. Rintoul said, referring to an increase equal to 1.8 degrees Fahrenheit." 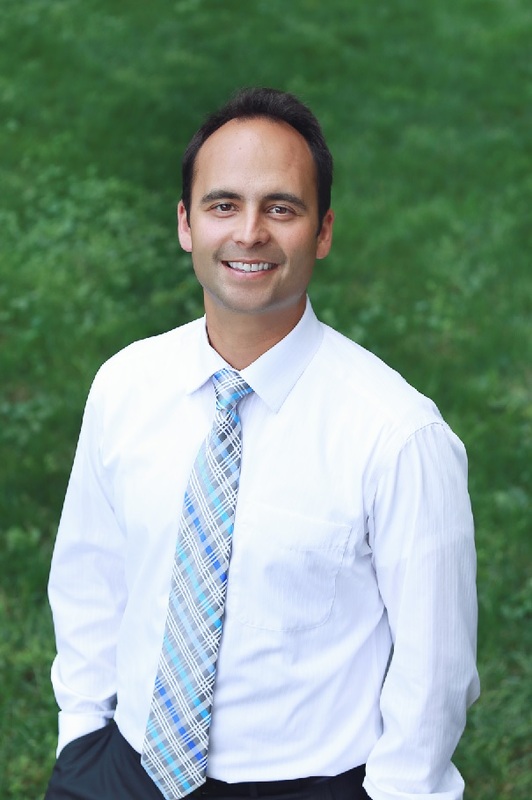 "He added, “It increases the odds those events will happen.”"
"Two new studies by researchers at NASA and the University of California, Irvine (UCI), detect the fastest ongoing rates of glacier retreat ever observed in West Antarctica and offer an unprecedented direct view of intense ice melting from the floating undersides of glaciers. The results highlight how the interaction between ocean conditions and the bedrock beneath a glacier can influence the glacier's evolution, with implications for understanding future ice loss from Antarctica and global sea level rise." "The two studies examined three neighboring glaciers in West Antarctica that are melting and retreating at different rates. Smith, Pope and Kohler glaciers flow into the Dotson and Crosson ice shelves in the Amundsen Sea Embayment in West Antarctica, the part of the continent with the largest loss of ice mass." "A study led by Bernd Scheuchl of UCI, published in the journal Geophysical Research Letters on Aug. 28, used radar measurements from the European Space Agency’s Sentinel-1 satellite and data from the earlier ERS-1 and ERS-2 satellites to look at changes in the glaciers' grounding lines — the boundary where a glacier loses contact with bedrock and begins to float on the ocean. The grounding line is important because nearly all glacier melting takes place on the underside of the glacier's floating portion, called the ice shelf. 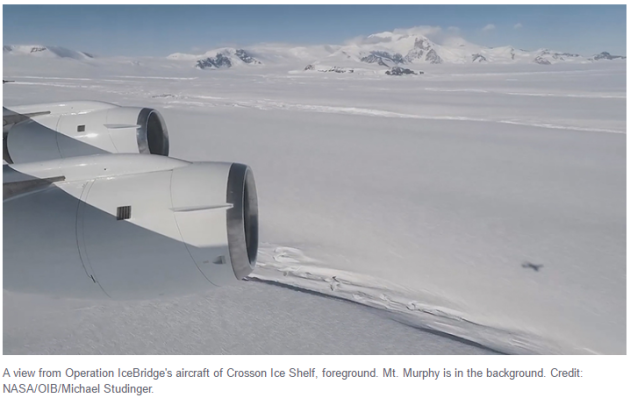 If a glacier loses mass from enhanced melting, it may start floating farther inland from its former grounding line, just as a boat stuck on a sandbar may be able to float again if a heavy cargo is removed. This is called grounding line retreat."